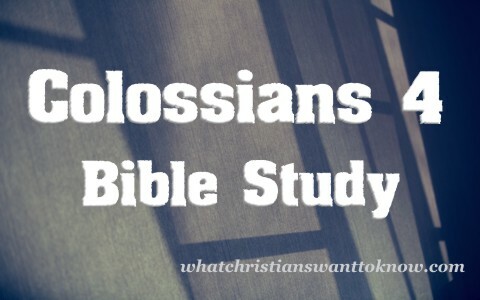 Here is a Bible study, summary, and discussion questions for Colossians chapter four. The Apostle Paul was concerned with those who had bondservants that they be treated fairly and justly and not be taken advantage of, which was happening to many of them, particularly those who are outside of the household of faith. That’s more understandable for unbelievers but we have no excuse for treating anyone unfairly or unjustly and should remember that we to “have a Master in heaven” to which we’ll be held accountable for how we treat others. What is the equivalent to a bondservant today? Why did the Apostle Paul have to remind the Colossians about treating their bondservants fairly and justly? There are several occasions in the Book of Colossians where Paul says we’re to pray always or continuously but this prayer request is specifically for Paul who asks for prayers for an open door to preach the gospel and more than that, he wants to make known the mystery of Christ. He asks for an open door and open hearts to receive Christ and to be shown how he ought to speak or what words he should use. Don’t you think Paul was already bold? If so, why does he ask for prayers for such a thing? What does Paul mean by asking that God would open a door for the word? The verse where Enoch walked with God and was no more is symbolic of our salvation and in fact, many of the heroes and heroines of the faith like Noah were said to walk with God (Gen 5:24; Gen 6:9; Heb 11:5) but here, Paul mentions that we should walk in wisdom toward those who are outside of the household of faith and to redeem the valuable time that we’ve all been given. Our words should be seasoned with salt, for without salt, we would did but also salt is a preservative and a cleansing agent but also stings to the wounds of the proud. If we do, we should know how to give an answer for the hope that lives in us (1st Pet 3:15). Why is “walking with God” seen as important to Paul? Why is our speech important to outsiders? What do you think being “seasoned with salt” means? When Paul addressed the Colossians, he reminded them of who was with him and being servants of God. They included Aristarchus, among others, who are laboring diligently in prayer for the church and who might have been for a time, imprisoned with Paul. Paul says that Aristarchus is one of the hardest workers in the faith, as far as Paul is concerned and so he wants them to welcome him. Do you believe, from the text, that Aristarchus was imprisoned or seen as a bondservant of Christ? Why does Paul call prayer a diligent labor? Was Paul concerned that they wouldn’t welcome Aristarchus? Another of Paul’s friends and helpers was Epaphras who is also “struggling on [their] behalf in prayers” for the purpose of the church being able to stand in maturity in Christ but also having the full assurance of what God’s will is for their life. Paul was an eye witness of his hard work in far flung places like Laodicea and Hierapolis. Why is Paul mentioning these men (Aristarchus and Epaphras) by name? Was Paul trying to reassure the Colossians in case these men came to visit them? The beloved physician, Luke, was indispensable to Paul and perhaps his medical training came in useful but also his eye for detail as historians have called Luke one of the greatest and most meticulous historians of his age. Paul again mentions people by name like Demas and Nympha who apparently had a house church, perhaps indicating that she was a godly woman of substance. Were house churches more common in the first century church than they are today? Why did they have to meet in Nympha’s home? In this last chapter of Colossians, Paul asks that the letter from Laodicea be read to the church but also the very letter he was writing them (Colossians) also be read to the church in Laodicea, showing that some of Paul’s letters (epistles) were already being circulated around the different churches, as was the case with the Book of Ephesians. What letter was from Laodicea? Why did Paul stress the importance of having these letters written to the churches in Colossae and in Laodicea? In Paul’s final sentence in the Book of Colossians, he adds his name to make sure that they knew it was an actual letter from Paul and to see the proof of this, he writes, “I, Paul, write this greeting with my own hand. Remember my chains. Grace be with you” (Col 4:18), so perhaps Paul ends the letter in his own handwriting, done while in chains, so that they’ll have no doubt that this is from Paul. He may have added this because there may have been some counterfeit letters, allegedly from Paul, which in fact, were not.